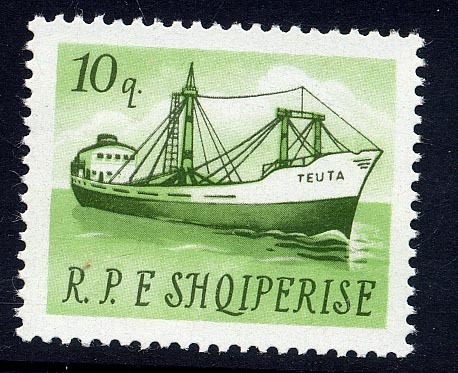 Albania has recently (1966) issued a set of ship stamps. They are of rather unimpressive design, but two are of interest, showing the motorships Vlora and Teuta on the 50 q. and 10 q. designs respectively. 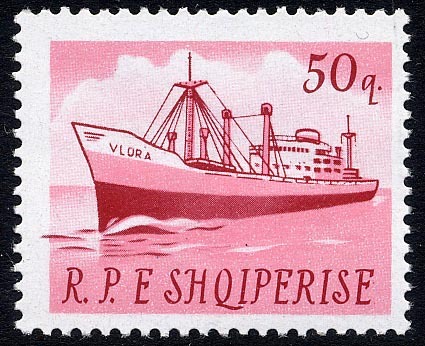 The Vlora, built in 1960 by the Cant. Nay. Riuniti at Ancona, is owned by the Makina Import Company, of Durazzo, and is a vessel of 8,649 gross tons, on dimensions 484 ft. 7 ins. x 63 ft. x 29 ft. 6 ins. She is fitted with a B. and W. oil engine constructed by the shipbuilders under licence. The Teuta is a much smaller motorship, of only 1,094 gross tons, on dimensions 237 ft. 7 ins. x 35 ft. 7 ins. x 15 ft.7 7/8 ins., owned by Albimport Tirana, of Durazzo. She was built in 1959 at Marina di Carrara by the Cant. Nay. Apuania. Her propelling unit is a 5-cylinder Fiat oil engine. Built as a cargo vessel under yard No 55 by Cant. Nav. Apuania, Marina di Carrara, Italy for Albanian State Shipping. 19 December 1959 launched as the TEUTA. Tonnage 1.094 grt, 610 net, 1.684 dwt., dim. 72.4 x 10.9m., length bpp. 65m. One Fiat diesel engine, 1.200hp, speed 11.5 knots. 2007 Sold by Adrian Tragaj to Velour Maritime Co., Cambodia and renamed ERATO. 2008 Sold to Bereket Ithalat-Ihracat Ltd., Turkey and arrived 16 June 2008 at Aliaga for demolition. Built as a cargo vessel under yard No 246 by Cant. Nav. Riuniti, Acona, Italy for Soc. Ligure di Armamento, Genoa. 04 May 1960 launched as the ILICE. Tonnage 9.670 grt, 5.132 net, 12.500 dwt. dim. 147.7 x 19.2m., length bpp 136.2m. One B&W diesel engine, 7.500 hp., speed 17 knots. 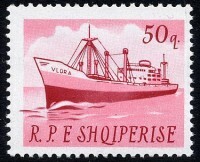 1961 Bought by the Albanian Government, renamed in VLORA. 1996 Sold by the Albanian State Shipping Enterprise, Albania sold to Turkish shipbreakers, and she arrived on 17 August 1996 at Aliaga for demolition. Source http://www.miramarshipindex.org.nz Lloyds Register. Navicula. Marine News 1996/696.